Lung cancer is the leading cause of death among malignant diseases in humans worldwide. In the last decade development of new targeted drugs for the treatment of non-small cell lung cancer proved to be a promising approach to prolong the otherwise very poor prognosis of patients with advanced UICC stages. Epidermal growth factor receptor (EGFR) has been in the focus of this lung cancer science and specific activating mutations are eligible for the treatment with specific tyrosine kinase inhibitors like gefitinib or erlotinib. Beside typical deletions in exon 19 and point mutations in exons 18 and 21 several insertions in exon 19 have been described and attributed activating properties as well. This is the first European and overall the 5th description in English literature of one of these specific insertions. To elucidate its structural changes leading to the activating properties we performed molecular modeling studies. These revealed conformational and electrostatic force field changes in the kinase domain of EGFR. To not miss uncommon mutations thorough and precise characterization of EGFR hotspots, i. e. at least exons 18, 19 and 21, should therefore be conducted to provide best medical care and to offer lung cancer patients appropriate cancer treatment. Mutations in the epidermal growth factor receptor (EGFR) are of special diagnostic value in advanced non-small cell lung cancer patients with therapeutic consequences [1–3]. The tyrosine kinase EGFR promotes via KRAS and PI3K mediated pathways tumor cell proliferation, cell survival and escape from apoptosis, while metabolic pathways are shifted towards synthesis of basic cellular elements such as nucleotids, fatty and amino acids [4–7]. Activating mutations in the EGFR gene are located in exons 18 through 21 while more than 90% consist of deletions in exon 19 and L858R substitution in exon 21. These activating mutations are eligible for the treatment with modern tyrosine kinase inhibitors (TKI), e. g. gefitinib or erlotinib [5, 8, 9]. Just recently, insertions in exon 19 have been described to have an activating character and are responsive to TKI therapy. These shall comprise approximately 1% of EGFR mutations . Described insertions are located at the mutation hotspot of nucleotids 2212 to 2234 thus just prior to the prevalence point of exon 19 deletions [2, 10–17]. In a 79 year old Kaukasian female patient we were requested to perform EGFR mutation analysis on a liver metastasis of a primary lung adenocarcinoma. The tissue specimen was collected by core biopsy. 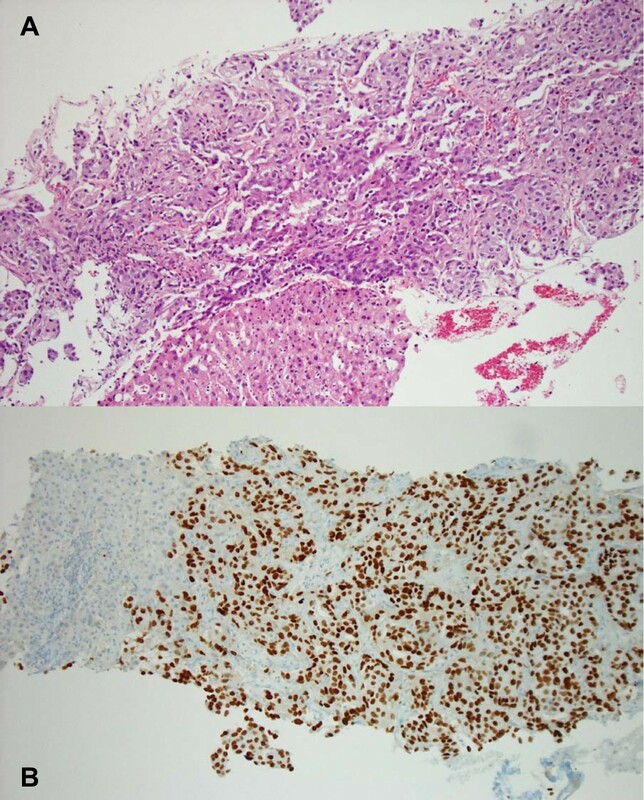 Histologic examination revealed metastatic formations of a predominantly solid adenocarcinoma. Immunohistochemical nuclear expression of TTF1 proved this to be of primary pulmonary origin (Figure 1). After microdissection of the tumor to enrich neoplastic DNA we performed Sanger sequencing for exons 18, 19 and 21 according to published routine protocol . While exons 18 and 21 were of wildtype sequence this analysis revealed a duplication of 18 nucleotids at position 22147_2235 (c.22147_2235dupl) in exon 19 which leads to the insertion of 6 amino acids (p.K745_E746insIPVAIK) (Figure 2A). Uncommon for EGFR mutations in non-small cell lung cancer the female patient presented here was of older age. Histologic morphology of the liver metastasis of the primary lung adenocarcinoma with predominantly solid growth pattern. (A hematoxilin-eosin stain, 10x; B immunohistochemical stain for TTF1, 10x). Molecular characterization of the described insertion in Exon 19 of the EGFR-gene. 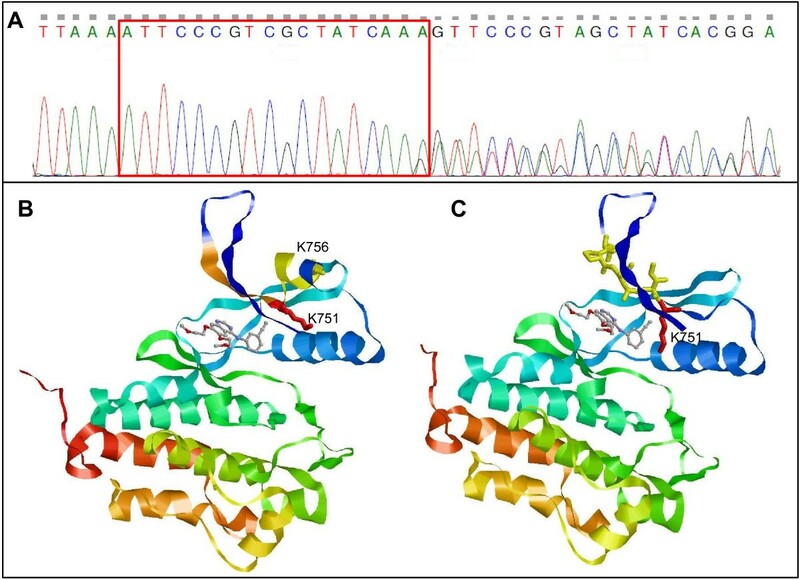 A) Sanger sequence of the mutation in exon 19 of the EGFR-gene. Indicated by the red frame are the duplicated 18 nucleotides which do not result in a mutation-typical double curve pattern. As wildtype and mutated DNA strands differ beginning with the end of the insertion/duplication, typical double curve pattern is occurring right behind the mutation. B) Molecular model of the mutated protein highlighting the insertion (orange area). Lysin 751 (K751, red) is displaced away from the aromatic ring of gefitinib, thus opening the ATP-binding pocket and changing its electrostatic properties. The 6 aminoacids following the insertion (yellow area) are now in a coiled-coil tertiary structure. C) Molecular model of wildtype EGFR in complex with gefitinib. Lysin 751 (K751, red) is in the vicinity of the aromatic ring of gefitinib. The yellow area is highlighting the site of the duplication. Since this is the 5th description of this specific duplication in exon 19 of the EGFR-gene in English literature and to our knowledge the first in Europe molecular modeling studies were performed using the SWISS-Prot server [19, 20] to investigate the structural changes of this mutation. Crystal structures of wildtype EGFR kinase domain without ligand (protein data bank entry 2gs2) and in complex with gefitinib (protein databank entry 1m17) served as templates for the homology modeling calculations. Visualization confirmed conformational changes in the ATP-binding pocket due to this insertion (Figure 2B and C). Most prominent is the displacement of the side chain residue of Lysin at position 751 (K751). In the wildtype structure this polar side chain is in the vicinity of the hydrophobic aromatic ring of gefitinib. Our modeling results indicate that due to the mutation the hydrophilic residue of Lysin751 opens the binding pocket. This may result in an alteration of electrostatic forces which could lead to a facilitated binding of gefitinib (Figure 2B and C). Insertions at this site of the EGFR gene result in a change in the ATP-binding pocket allowing a facilitated activation of effector proteins like RAS or PI3Kinase to promote tumor cell proliferation and survival [10, 21]. The conformational changes observed here could also explain these published capabilities of exon 19 insertions. Since exon 19 and especially this subregion of the exon displays a hotspot for genetic mutations of the EGFR gene specific DNA structures at this location on chromosome 7 must prevail. Amongst those small loops due to an adenosine and thymidine rich DNA segment at this location can be suspected to enable cross links in between the same or the complementary DNA-strand . These cross links may then not only result in deletions, which are the most common mutations at this site of exon 19, but also in a duplication, as described here of 18 nucleotides. Several methods for the evaluation of EGFR-status in non-small cell lung cancer have been described [23–30]. Nevertheless contemporarily new mutations are being detected and their biological impact is in the focus of scientific research. Thus, complete sequencing of the mutation hotspots, i. e at least EGFR exons 18, 19 and 21, leads not only to new insights in tumor biology but also has great therapeutical impact for the patient. Only complete sequenicing will detect new or uncommon mutations which may also respond to TKI therapy. Concluding, insertions in exon 19 are likely to respond to TKI therapy. Since not only activating mutations of the EGFR gene exist, but secondary resistance to TKI-therapy can be a result of additional mutations thorough analysis and exact characterization of EGFR mutations by sequence analysis in non-small cell lung cancer should be performed. Data publication is in concordance with the decision of the ethics committee of the University Medical Center Freiburg (EK 10/12). The authors state that no conflict of interest exists. Clinical assessment and mutation analysis CO and GK; scientific workup and molecular modeling CO, GK; manuscript preparation CO, GK; proofreading: CO, AC, PF, GK, MW. All authors read and approved the final manuscript.